I recently finished reading Garry Mulholland’s Fear of Music: The 261 Greatest Albums Since Punk and Disco. I picked it up to fill in the gaps of my popular music education–specifically the years between 1989 and 1999 when I was either pursuing classical music (and felt obliged to shut out pop influences, oh boy, isn’t that a ripe topic for discussion…) or too involved in some obscure corner of avant-garde/jazz/experimental/electronic/other to pay attention to what the “kids” were hearing. It’s a fun read, thanks largely to Mulholland’s cheeky streak but even more so to his idealism. Mulholland values his pop music for its world-changing properties as much as for its booty-shaking abilities. And his disappointment as each starry-eyed group and movement sells itself short to crass commerce and popular opinion is somehow registered with eternal optimism: maybe something stuck this time around, maybe lessons were learned, maybe it will all be different next time around… Too bad it never quite works out that way. The NYTimes has a story on the VÃ©lib bicycles newly available for rent in Paris. The pricing system seems especially appropriate for bicycle commuters: free for the first half-hour, 1 euro for the second half-hour, 2 euros for the third half-hour and 4 euros for each half hour after that. Many factors would need to work together to make such a system work in the US, including size of the city (populous enough to support a regular ridership, but not so sprawly as to make short bike trips impractical), number and location of stations, and biking infrastructure, to name a few. NYC comes to mind as a place where the US version of the VÃ©lib could take root. Modify the gear ratios, beef up the brakes and San Francisco might be in the running. Making the bikes tourist friendly may be a necessity, but it could also open up possibilities for cities like DC or Charleston, SC or numerous national parks. 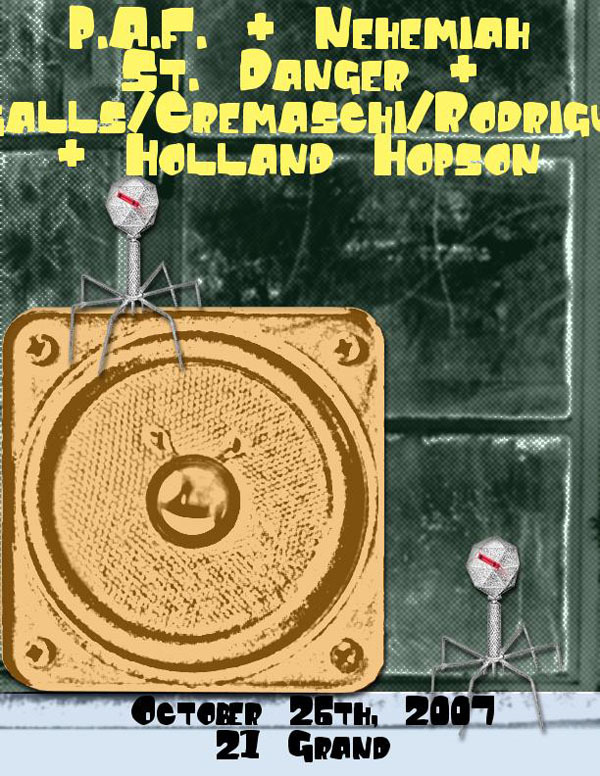 Here’s a duet with Thomas Helton, bass + electronics and Holland Hopson, saxophone + electronics from the 2003 No Idea Festival in Austin TX. Oakland-based heavy-Americana trio P.A.F. curate an eclectic evening of improv, noise, psych and rock crossing lines and blurring distinctions between your scene and mine. I transferred it to the secondary fermenter a few days ago and gave it a preliminary taste. Yum yum. It’ll go into bottles in a week or two and should be ready to drink for Thanksgiving. Soundverge, David Manson’s radio shows are now available on Odeo. The radio shows accompany the long-running EMIT Series of events in Florida and currently feature Gustavo Matamoros, Holland Hopson, and David Liebman with Abbey Rader. Here’s the second duet with guitarist Sandy Ewen from the 2003 No Idea Festival in Austin TX. Going through some old recordings I ran across these duets with guitarist Sandy Ewen from the 2003 No Idea Festival in Austin TX. Sandy is playing her distinctive chalk-guitar and I’m on squeaky sneakers, soprano saxophone and live electronics. Sandy is now with the Weird Weeds and also plays with Tom Carter as Spiderwebs.